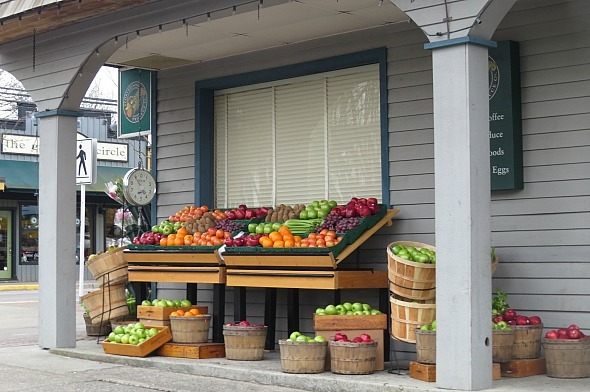 Modern-day fairy tale series Once Upon a Time’s fictional Storybrooke includes storefronts on Moncton Street in the village of Steveston and other store fronts 50 kilometres away on Glover Road in the village of Fort Langley. This week Once Upon a Time returned to Fort Langley after more than a year’s absence, turning the historic yellow-and-white Community Hall into the Storybrooke Town Hall. 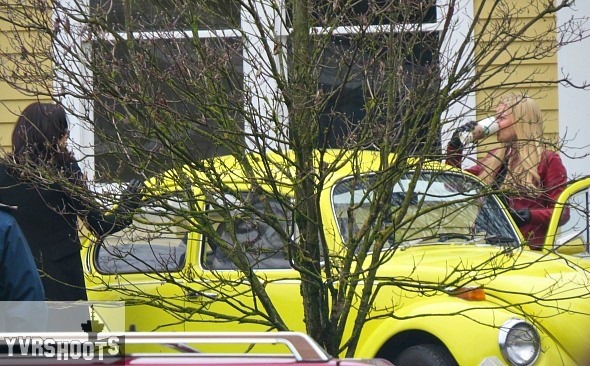 The Charmings (Josh Dallas & Ginnifer Goodwin), Hook (Colin O’Donoghue) and Henry (Jared Gilmore) gathered outside to say goodbye to Emma (Jennifer Morrison), who was joined in her yellow VW bug by Regina (Lana Parrilla) for a road trip. Related: CaptainSwan and SwanQueen Film at Fort Langley Community Hall. More than a year ago, Once Upon a Time filmed Emma and Regina — SwanQueen — on a stakeout in the VW bug outside the Town Hall for season three. 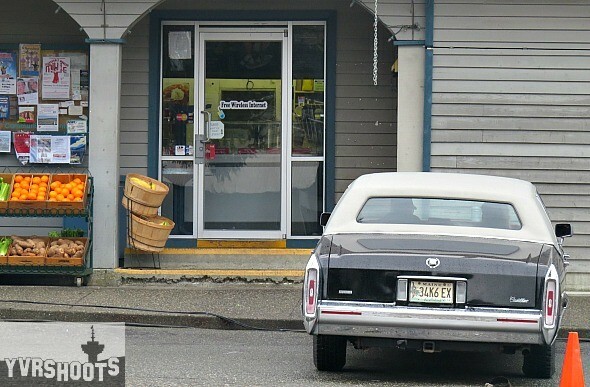 Related: Once Upon a Time Films SwanQueen VW Bug Scene in Fort Langley – Season Three. And opened Once Upon a Time season two with scenes of wraith destruction at the Town Hall. 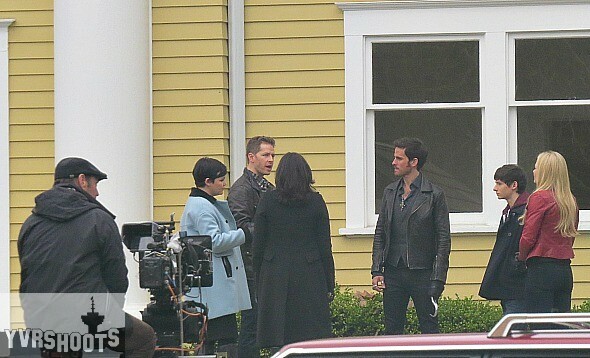 Related: Once Upon a Time Films in Fort Langley – Season Two. 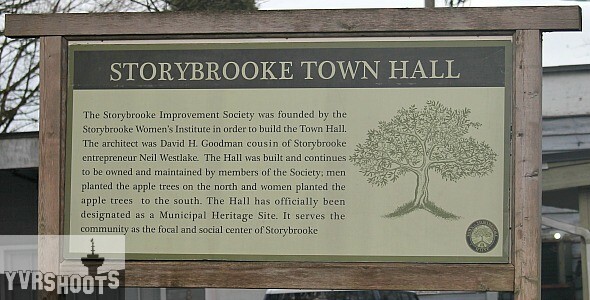 Once Upon a Time’s inaugural season came to Fort Langley a few times, dressing the Hall with a “Debate Today” banner and Swan for Sheriff posters for a Storybrooke Sheriff’s election after Graham (Jamie Dornan)’s death and a Miners Day banner for Grumpy’s backstory. Related: Once Upon a Time Films in Fort Langley – Season One. 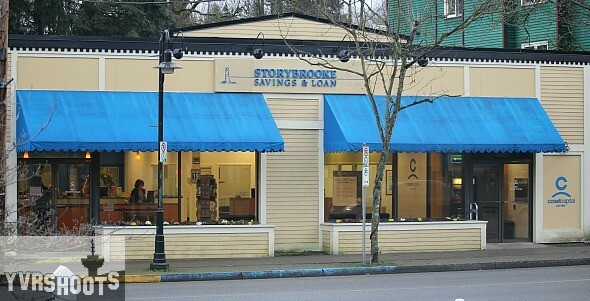 As in Steveston — Once Upon a Time’s go-to Storybrooke location — certain Fort Langley buildings become Storybrooke institutions like the Coast Capital Savings as Storybrooke Savings & Loan. 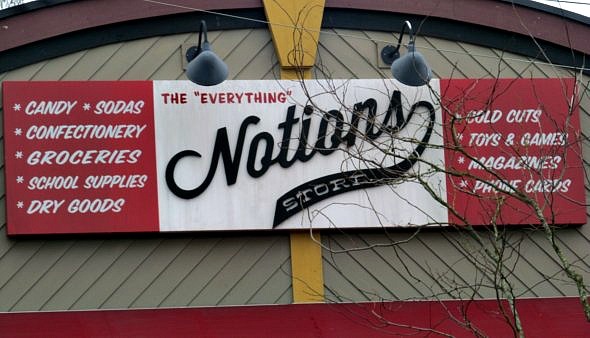 And a shop on Glover Road as The “Everything” Notions Store for a scene of Belle (Emilie de Ravin) and Will Scarlet walking down Main Street hand-in-hand. Related: Once Upon a Time Films Emilie de Ravin & Michael Socha in Fort Langley. 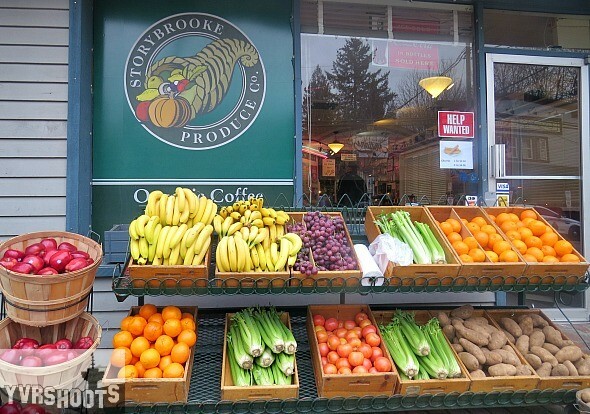 But the one that fooled me on Thursday was Cafe Planet Java 50s as Storybrooke Produce Co. I did a double take and almost bought some grapes. Related: Once Upon a Time’s Robert Carlyle & Patrick Fischler Film in Fort Langley. 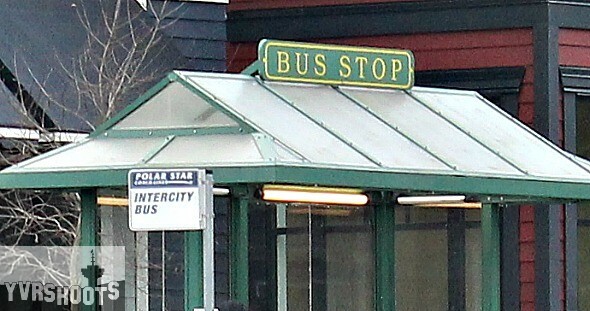 Also unique to this visit: a Fort Langley community bus stop as the Polar Star Intercity Bus. Fans on set this week. 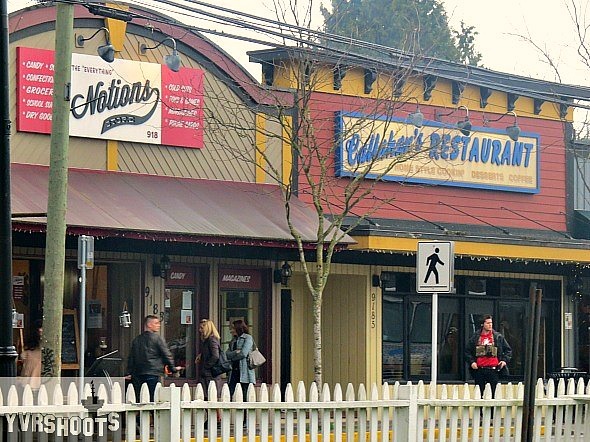 Will they be filming in fort langley again or is all of Storybrooke filmed at Stevenson Town now?